"We are survivors. We are not victims." We are survivors. We are not victims. Carey Nason is a past Not Here conference speaker, and the Program Director for Hope Rising, a branch of Saint Andre Home. 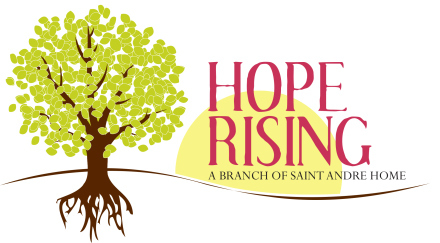 Hope Rising is an anti-trafficking program that provides residential treatment for women who have experienced commercial sexual exploitation. Carey is a Licensed Clinical Social Worker (LCSW) and Licensed Alcohol and Drug Counselor (LADC). She has several years of experience working with survivors of violence, particularly sexual and domestic violence. When I was asked to write a piece for the Not Here blog, I considered the many things I could share. From the ways we can address trafficking, to the many successes of the residents at Hope Rising, to the collaborative efforts occurring throughout Maine and New England to support survivors of trafficking. I then asked the residents at Hope Rising what message they wanted people to know. And what an important message to share. Being a victim meant they had no control over what was happening to them. Their choices and freedom were removed. They were controlled by their traffickers. Being a survivor means having choices and the opportunity to live the life they want to live, and not having to be under someone’s control. Literally, being a survivor means surviving something that could have, and for many, almost took their lives. The residents also wanted to share some of the mission and value statements they developed that represent the work they are doing at Hope Rising. They felt these best describe what it means to be at Hope Rising. We are here to live a safe, sober, healthy life. We are here to learn skills to be able to take care of ourselves independently. It’s about knowing ourselves and making the choices we want to make, speaking our opinions and growing healthy relationships. We are women of worth. We value trust and honesty. Each person has the right to ask for and get what she needs. We support each other’s successes.